CSU Summer Arts at Fresno State! KFSR celebrates Jazz Appreciation Month in April! Join us for three one-hour Ella Fitzgerald ‘mini-marathons’ celebrating JAM kick-off (4/1), Ella’s birthday (4/25) and International Jazz Day (4/30). 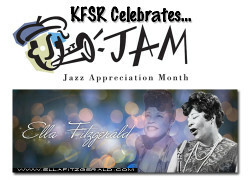 The Ella Fitzgerald Charitable Foundation is a proud sponsor of 90.7 KFSR.